Seattle saw record snowfall on Monday, with parts of the Pacific Northwest seeing 3 inches that shut down schools and offices and canceled hundreds of flights. The June Mountain resort in California was forced to close as it saw as much as 9 feet of snow, while in the southern part of the state, nearly a foot of rain landed in some parts. These western storms should continue marching east today, taking with them a mixed bag of precipitation to the Midwest. 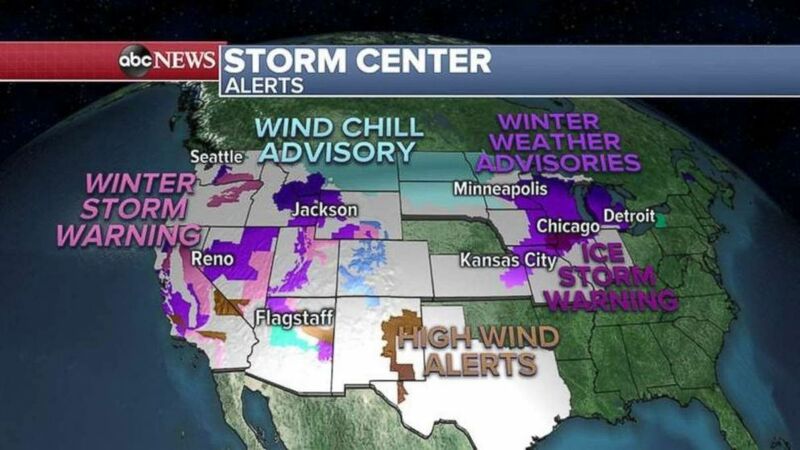 Weather alerts and advisories this morning cover a significant portion of the U.S. Weather advisories and alerts have been issued over much of the U.S. this morning. The Twin Cities and Chicago can expect heavy snow as the western storms head east. Flights in and around those areas are likely to be delayed or canceled. 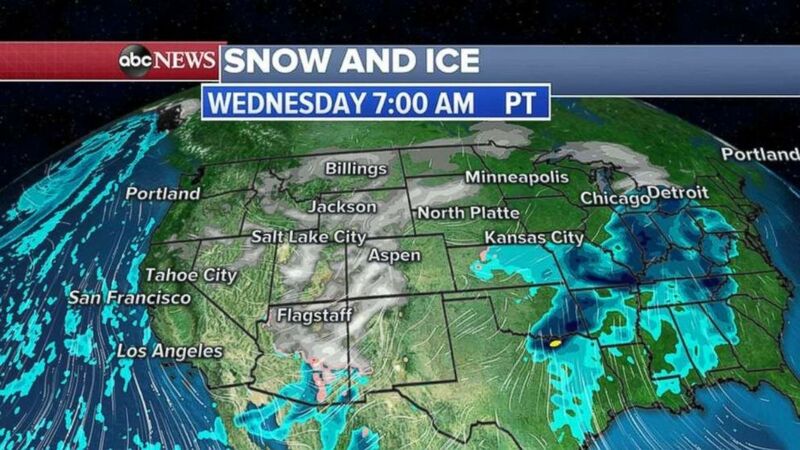 Meanwhile, snow will continue to fall in the western mountains, with 1 to 2 feet likely today in California and Colorado. More snow and ice are heading east tonight. 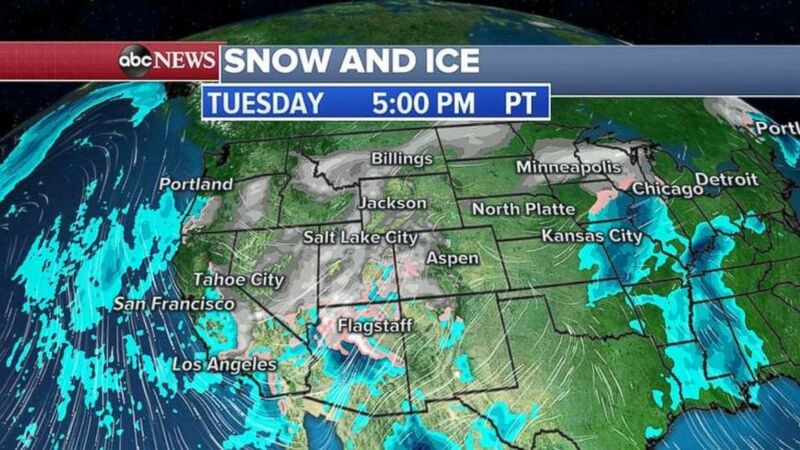 The West Coast system should be cleared out by Tuesday night, with the main storm moving inland to the Rockies by Wednesday morning. More snow and ice are heading east tomorrow morning. Parts of the Midwest may see more than a foot of snow over the next few days, with significant ice in Chicago, Milwaukee, Detroit and Kansas City. It will be much warmer elsewhere, with temperatures in the Southeast, and some stretching to the Northeast, about 20 to 30 degrees above average. 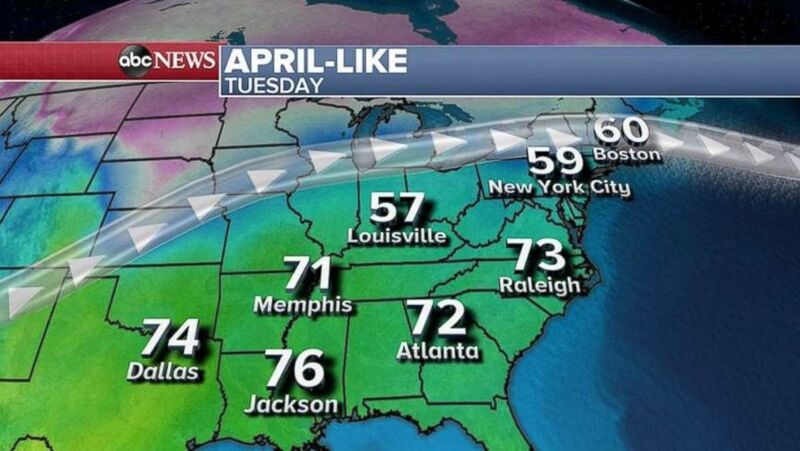 Springtime came early for this part of the country, as highs in Boston and New York city are approaching 60 degrees. In the Southeast today, it should feel like springtime.